News is slowly seeping its way into the press regarding the incredible discovery and excavation of the SS City of Cairo, a World War II British Merchant Navy vessel sunk in the South Atlantic at the height of the Battle of the Atlantic. The stories surrounding the City of Cairo are numerous with an entire book, Goodnight, Sorry for Sinking You, having been written about her sinking and the travails of her survivors. The City of Cairo was traveling from Bombay, India to the UK with stopovers in South Africa and Brazil and among her cargo of 7,422 tons were 2,000 boxes of silver Indian rupees stowed in the Number 4 hold. The survivors then began what would become an epic and tragic fight for survival. Unfortunately, the boats rapidly lost touch with one another in the vastness of the South Atlantic. One group consisting of three boats with 155 survivors was picked up on November 19th after thirteen harrowing days at sea. The group had nearly made it to their destination of St. Helena which was 500 miles from the point of sinking. Another group of only 2 survivors was picked up on December 27th only 80 miles from the coast of Brazil. The original group of 17 had sailed nearly 2,000 miles before being rescued. The third group of three survivors were rescued by a German blockade runner, Rhakotis on December 12th. One of the survivors perished aboard the Rhakotis. For the two survivors, their story became even stranger when, on January 1, the Rhakotis was herself intercepted and sunk by Allied warships. Thankfully, the two were rescued and brought home safely to the United Kingdom. In all, 104 persons died as a result of the sinking. Public information is very limited as the salvors have sought a low profile with the project, but the salvage company Deep Ocean Search is claiming to have recovered 100 tons of silver coins from the wreck of the City of Cairo over the last few years. If true, then it is quite an accomplishment as the wreck lay in 17,000 feet of water and days of sailing from the closest port. The photos of the wreck and coins provided by Deep Ocean Search are quite stunning. There has been no word on whether the company intends to make the coins available for sale or is melting them for sale into the precious metals market. 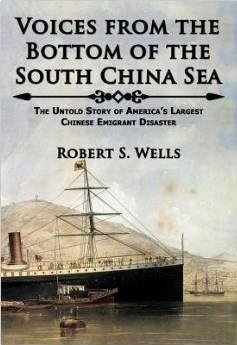 Robert Wells, a retired US Navy captain, recently released his first book, Voices from the Bottom of the South China Sea | The Untold Story of America’s Largest Chinese Emigrant Disaster , an intriguing investigation into the tragic sinking of the SS Japan in the late 19th century. Leading the reader through a wealth of primary sources and photographs, Wells pieces together the origins of Chinese emigration to the US in the mid to late 19th century. Tales of the wealth of Gum Shan (Gold Mountain, aka the United States) lured thousands of Chinese residents of Guangdong province to the California coast as laborers for farms and the infant transcontinental railway system. Wells relates the travails a Chinese emigrant would endure from leaving his farm to boarding the vessel to finding work in Gum Shan as well as his return journey with, hopefully, a money belt full of silver coin. A notable discussion from the book is the shipping of the bones of Chinese who perished in the United States back to China for permanent burial in their native land. This practice was most recently in the news in November of last year when a documentary of the SS Ventnor aired in New Zealand. The Ventnor was carrying the bodies of 499 Chinese miners back to China when she sank in 1902. Overall Wells has done historians and casual readers a great service by documenting a little remembered part of Sino-American history as the SS Japan was the deadliest maritime disaster of the 19th century Chinese emigrant wave. Readers will enjoy the numerous illustrations, tales of sunken treasure aboard the SS Japan and general machinations of the Chinese emigrant trade covered in Voices from the Bottom of the South China Sea | The Untold Story of America’s Largest Chinese Emigrant Disaster . On the night of October 17, 1863, the sleepy town of Tampa was awakened by the blast of Union gunboats firing on Fort Brooke at the town’s edge. The Union gunboats had been in from their blockading stations offshore to create a diversion for the landing of a 100 man Yankee raiding party. Lying at anchor six miles up the Hillsborough River were the targets of the raiding party: a barge and two Confederate blockade runners, the schooner Kate Dale and the steamer Scottish Chief. The ships had braved the Union blockade multiple times to sail between Cuba and Tampa – exchanging cotton and cattle hides for arms, munitions, and Cuban cigars and wine. The raiding party made their way up the riverbank and set fire to the three vessels, ending their blockade running careers in a ball of flames. The Kate Dale and the barge sank at anchor while the Scottish Chief sustained serious damage but did not sink. The ship was later towed down the river where its machinery was salvaged and the hulk left to sink into the river. A Confederate response force, having been alerted to the presence of the Yankee raiding party, pursued the Union soldiers to Ballast Point near the terminus of Old Tampa Bay. At Ballast Point, now a popular pier at the end of Bayshore Boulevard, a quick skirmish ensued. Three Yankees and twelve Confederates lost their lives before the Yankee raiding party was able to embark and escape harm’s way. In September 2008, nearly 145 years after the raid, marine archaeologists announced the discovery of the wreckage of the Kate Dale in the Hillsborough River. A year later, the Scottish Chief was discovered further down the river where she had been left to rot after having her machinery stripped. 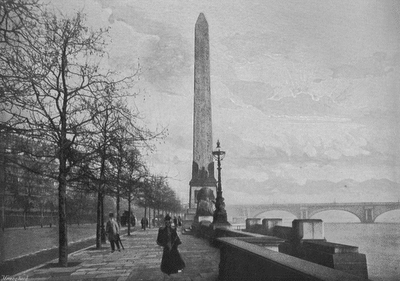 For nearly a century and a half, an Egyptian obelisk has graced the Victoria Embankment along the Thames River in London. Flanked by a pair of sphinxes, the obelisk was gifted to the United Kingdom by Muhammad Ali, the ruler of Egypt and Sudan, in 1819 in honor of two British victories in Egypt including Admiral Nelson’s victory at the Battle of the Nile. While the gift was a magnanimous one, the cost of transporting it to the UK proved prohibitive and the obelisk lingered in Egypt until 1877 when £10,000 was donated by a philanthropist to ship the monument to London. 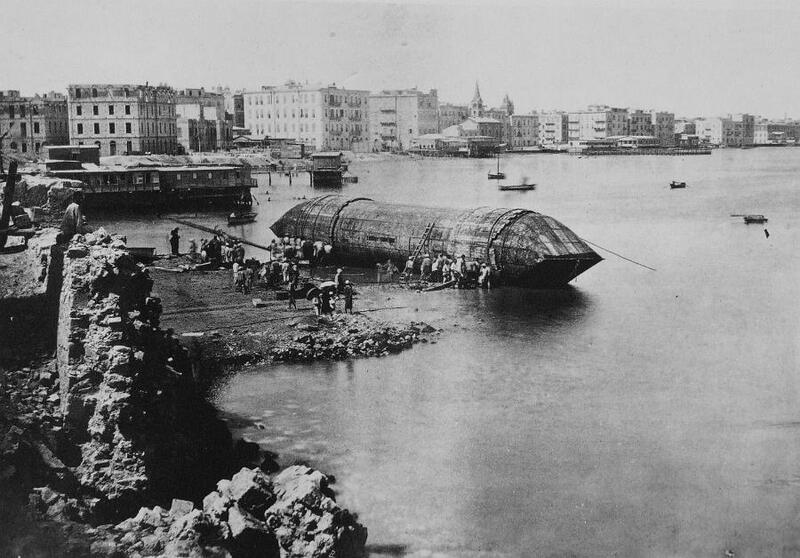 Carefully ensconced in an enormous iron cylinder outfitted with a rudder, deckhouse and dubbed Cleopatra, the 69 foot, 224 ton red granite obelisk began its long journey to London from Egypt. Tragedy struck the needle and its tow vessel Olga on October 14, 1877 when a storm struck in the Bay of Biscay. As the towed cylinder began to buck and roll amidst the storm’s swells, six crew were dispatched from the Olga to steady the Cleopatra. Sadly, their boat capsized and the men were all lost. The Olga was able to rescue the six men aboard the Cleopatra and the needle was abandoned to the vagaries of the storm in a sinking state. Four days later the Cleopatra was discovered adrift by Spanish trawlers and was salvaged by the steamer Fitzmaurice out of Glasgow. After paying off the salvage claim, the Cleopatra finally arrived in the UK on January 21, 1878 after a harrowing and deadly journey. The needle was erected on September 12, 1878 and has attracted tourists and Londoners alike ever since. As bombs rained down on London, Liverpool and other British cities during the dark days of the Blitz, one bomb not only made waves, but also revealed that truth is often stranger than fiction. Floating on the River Thames on the night of September 23, 1940 was the training ship Cornwall, a former British wooden hulled ship of the line converted to training duties for youngsters. 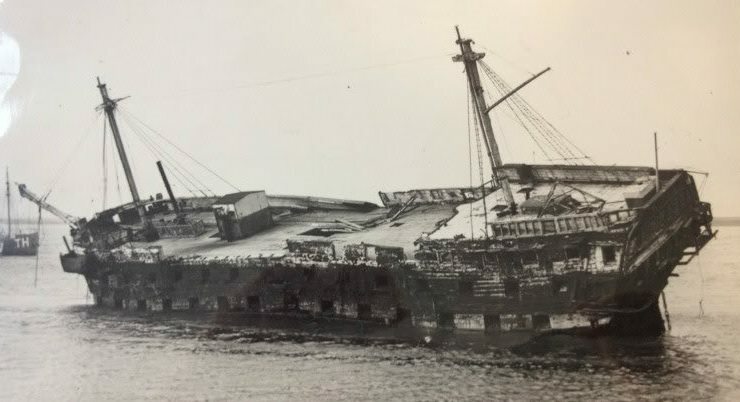 During that night’s Luftwaffe raid, though, the ship was severely damaged and eventually sank to be refloated and broken up for scrap in 1948. In sinking, the ship became the last Royal Navy ship of the line to be lost to enemy action as well as the only one to be sunk in an air raid. Although the Cornwall met a rather ignominious end at the bottom of the Thames, the ship was once a jewel in the British fleet. 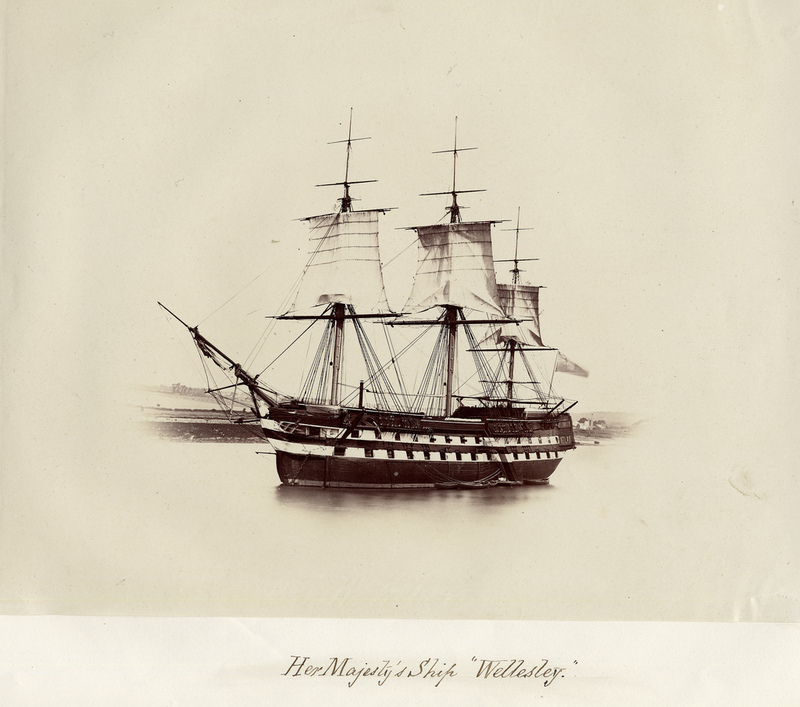 Laid down in 1812 and commissioned in 1815 as HMS Wellesley, the ship was built out of teak which made her incredibly resistant to rot. The ship spent much of her time in active service in the Indian Ocean and Far East. In 1839, the Wellesley led the successful attack on and capture of Karachi and was subsequently heavily involved in the First Opium War. By 1854 the ship was retired to guard duty and was opened on May 5, 1859 as a reformatory ship for 260 boys under the School Ship Society. The next 80 years saw her continue in this role as she bounced between ports in the UK. Sadly, the ship was the subject of some scandal when, in 1903, seven boys contracted typhoid from cheap blankets that had been sold to the ship unwashed and infected by army hospitals. 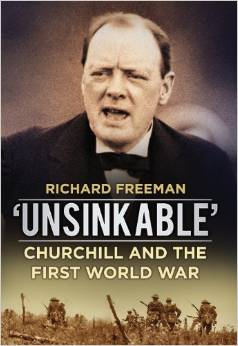 Richard Freeman’s latest publication, ‘Unsinkable’ , is a critical look at Winston Churchill’s role in the Great War. Freeman advances the position that Churchill is given less credit than he deserves for his role in Great Britain’s victory in World War One. The book follows Churchill from his initial days in the Admiralty to his time in Flanders as an infantry officer to his ultimate role as Minister of Munitions at the end of the war. Freeman makes a very compelling case based upon historical evidence and documents not declassified until after the war that Churchill was made the scapegoat for the Gallipoli disaster and that he was the victim of political infighting and poor political choices on his own part. The book’s 240 pages fly by as Freeman, in writing ‘Unsinkable’ , has delivered a highly readable book, even for those not necessarily interested in the inner workings of British politics during World War One. Overall, Freeman should be credited with producing an excellent addition to the vast array of literature about that indefatigable lion of late 19th and early 20th century British life, Winston Churchill. On September 15, 1942, a powerful task force of US naval vessels steamed towards Guadalcanal Island in the South Pacific. Consisting of the aircraft carriers USS Wasp and Hornet, the battleship USS North Carolina and ten other vessels, the task force intended to land a regiment of US Marines on Guadalcanal to reinforce the US troops already vying for control of the island. As mid-afternoon approached, a Japanese submarine, I-19, maneuvered within firing range of the squadron and loosed a volley of six torpedoes at the Wasp. Despite attempting to outmaneuver them, three of the torpedoes slammed into the Wasp while a fourth missed and struck the North Carolina. 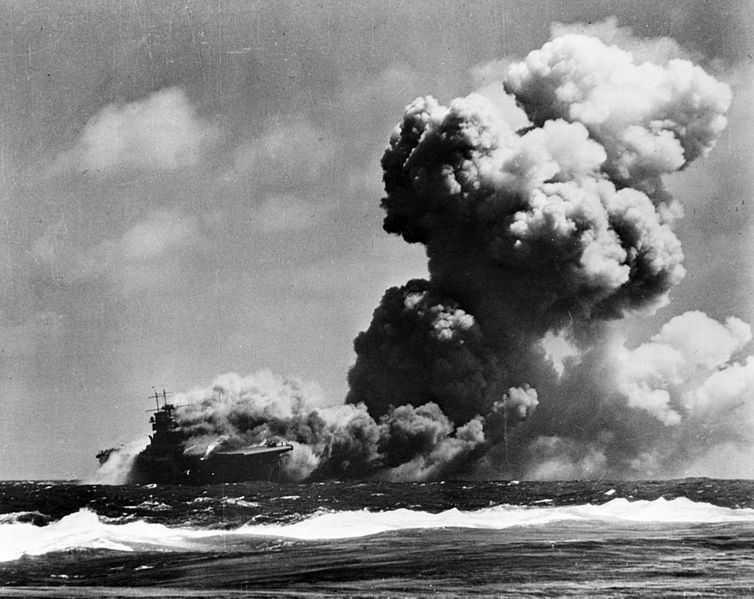 A mighty conflagration quickly ensued as the torpedoes had detonated close to the ship’s fuel stores and magazines. Damage control efforts and maneuvering into the wind proved fruitless and within 35 minutes of the torpedo strikes, the order for abandon ship was given. When the Wasp finally slipped beneath the Pacific Ocean’s waves, 193 souls followed her leaving approximately 1900 survivors with 366 of them wounded. Unfortunately for the Wasp and her crew, the Wasp had been built on the tail end of the limitations of the Washington Naval Treaty of 1922. As a result, the ship had minimal armor and suffered from a poor design for ammunition and gasoline storage in order to fit the ship into the tonnage restrictions left to the US Navy under the treaty. Sadly, the US Navy lost 193 good men, 45 aircraft and a valuable ship to the good intentions of a treaty designed to prevent conflict – a treaty which proved to do nothing but force allied naval forces to fight with one hand behind their back for the first years of World War Two.